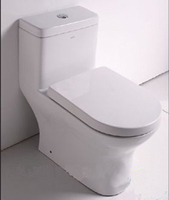 If you are renovating an entire bathroom or simply replacing an old or broken toilet, the T-31120 is a one piece toilet featuring an elegant design that will blend effortlessly into any surrounding. The elongated front bowl is matched with the simple clean lines of the 6L lined tank and chrome flush handle. This toilet features a dual flushing system.